Let OUC light the way to save energy, water, and cost efficiency. 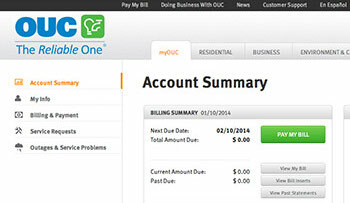 OUC is dedicated to providing tips and tools to help you reduce your consumption. Expanding solar options brighten the future for clean, sustainable energy. We’re finding innovative ways to make solar an option for all kinds of situations. Whether you already own an electric vehicle or are considering buying one, OUC has resources to help you make a decision that's right for you. We can help you keep your workforce, customers or residents on the move with hassle-free, cost-effective EV charging stations. We offer expertise and reliable service from start to finish. An instrument to review your usage patterns, which can help you better understand when you use the most electric and water, and therefore, reduce your bill. Companies committed to being good corporate citizens can pursue LEED Certification for the design, construction and operation of their buildings. OUC is well positioned to guide your company through this process as our own Reliable Plaza is Gold LEED certified.